For these cards I used MojoMonday Sketch #326. Of course, I tweaked it a bit - I really can't leave anything alone. I used some old Paper Studio paper I had in my stash along with some kraft card stock. I inked all the edges in Tim Holtz Vintage Photo and stamped the sentiment in Momento Tuxedo Black. The sentiment is from the Fiskars Laugh With Me set. The ribbon is from American Crafts and I adhered it with Scor-tape to be sure it doesn't move. 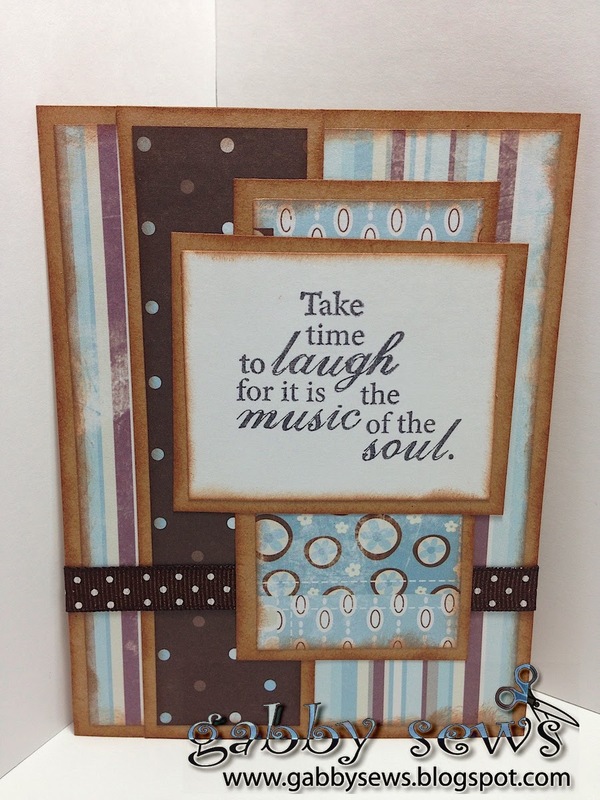 I was actually able to make six cards but only had four sentiments stamped out. I saw an idea recently to leave the sentiments off until you know what you are going to need. I really like that idea and want to start building up a supply of these "almost done" sort of cards. It would be so easy just to pick one out and then grab whatever sentiment you needed at the time. I also think this design would be great to make a collection pack of cards or even monogram notecard sets. I think I see some ideas for my Etsy shop! Someday maybe I'll really have enough stuff built up to actually open that shop I've put together!! I just keep sending them all off to OWH or giving them to friends and family. Anyone else have that problem?